The Pro Edge snow rake is the greatest innovation for snow removal in decades. A secret weapon for car dealerships to remove snow from vehicles quickly, effectively, and easily. 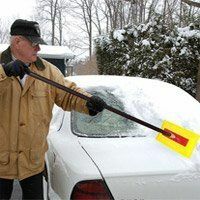 So easy in fact it’s a great gift for the elderly and people who hate clearing off their cars with the traditional snow brush. Check out the Snow broom in action, and see how it chops right through frozen snow. The sturdy polyethylene brush can cut through snow without damaging your vehicle or paint job. Every brush comes with a 48″ telescopic, removable handle. Long enough to clear the roof of large trucks and vans. 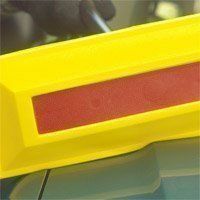 The ProEdge features a narrow squeegee-like edge around the entire head to contour to the vehicle’s surface. The ProEdge enables you to be both thorough and fast when cleaning off vehicles. Push or pull even heavy wet snow from the roofs of full sized trucks, mini-vans, and automobiles. Quickly clear tight spots around the grill, wipers and bumpers. 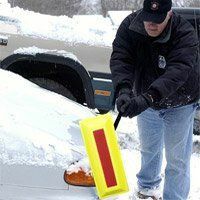 Tight “V” edge-design slices through deep or wet snow to get down to the surface of the vehicle. Square corners of the ProEdge head enable you to clear areas that other snow rakes can’t reach. Vinyl coated, rolled steel telescoping handle features for dependable performance, fits in any car.